Jacob Miller was known as one of Jamaica’s most distinctive vocal stylists, with a trademark vibrato he used to accent his performance. He was born in Mandeville, Jamaica to Joan Ashman and Desmond Elliot. At the age of eight he moved to Kingston, Jamaica where he grew up with his maternal grandparents. In Kingston, Miller began spending time at popular studios including Clement Dodd’s Studio One. He recorded three songs for Dodd, including “Love is a Message” in 1968, which the Swaby brothers, (Horace, later called Augustus Pablo, and Garth) played at their Rockers Sound System. While the song did not garner much success nor maintain Dodd’s attention in Miller, it resulted in Pablo’s sustained interest in Miller. After the brothers launched their own label in 1972, Pablo recorded a version of “Love is a Message” named “Keep on Knocking” in 1974. In the next year and a half Miller recorded five more songs for Pablo, “Baby I Love You So,” “False Rasta,” “Who Say Jah No Dread,” “Each One Teach One,” and “Girl Named Pat”, each of which became a Rockers classic with King Tubby dubs on their b-sides. These singles developed Miller’s reputation and ultimately drew Inner Circle to hire him as a replacement lead singer. Inner Circle was an emerging reggae group made popular playing covers of American Top 40 hits. Band leader Roger Lewis said Jacob Miller was “always happy and jovial. He always made jokes. Everyone liked jokes.” Adding Miller as lead singer, the band’s lineup was Roger Lewis on guitar, Ian Lewis on bass, Bernard “Touter” Harvey on keyboards, and Rasheed McKenzie on drums. Coining Miller as Jacob “Killer” Miller, the group continued to build popularity. They signed with Capitol Records in 1976 and released two albums, Reggae Thing and Ready for the World. Their first hit with Jacob Miller was “Tenement Yard”, followed by “Tired Fi Lick Weed In a Bush”. While recording, Miller continued pursuing a solo career, recording “Forward Jah Jah Children,” “Girl Don’t Com” produced by Gussie Clarke, and “I’m a Natty” produced by Joe Gibbs. He earned second place in Jamaica’s 1976 Festival Song competition with the song “All Night ‘Till Daylight” and produced his first solo album in 1978, Dread Dread. While most of Miller’s solo work were backed by Inner Circle members, his preferred rockers style diverged from the tendency of Inner Circle to experiment with other genres, including pop, soul, funk and disco. The track which has brought him the most lasting recognition is the rockers standard “King Tubby Meets The Rockers Uptown” with Augustus Pablo, a dub of “Baby I Love You So,” engineered by King Tubby. Other notable tracks with Augustus Pablo included “Keep on Knocking,” “False Rasta” and “Who Say Jah No Dread”, all produced by Pablo. The album Who Say Jah No Dread featured two versions of each of these tracks; the original and a dub engineered by King Tubby. Jacob Miller was featured in the film Rockers, alongside many other musicians including Gregory Isaacs, Big Youth and Burning Spear. In the movie, he plays the singer of a hotel house band, (in reality Inner Circle), who are joined on drums by the film’s hero, Leroy “Horsemouth” Wallace and play a live version of Inner Circle’s hit “Tenement Yard”. In March 1980, Jacob Miller went with Bob Marley and Chris Blackwell to Brazil, to celebrate Island opening new offices in South America. On Sunday, March 23, 1980, Miller was killed in a car accident on Hope Road in Kingston, Jamaica. 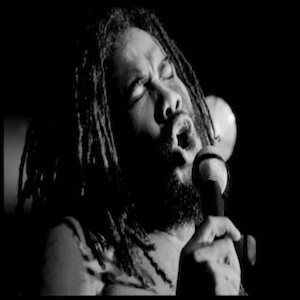 Miller and Inner Circle had been preparing for an American tour with Bob Marley and the Wailers, and the next album, Mixed Up Moods, had been recorded before his death. Jacob Miller was UK reggae artist Maxi Priest’s cousin.